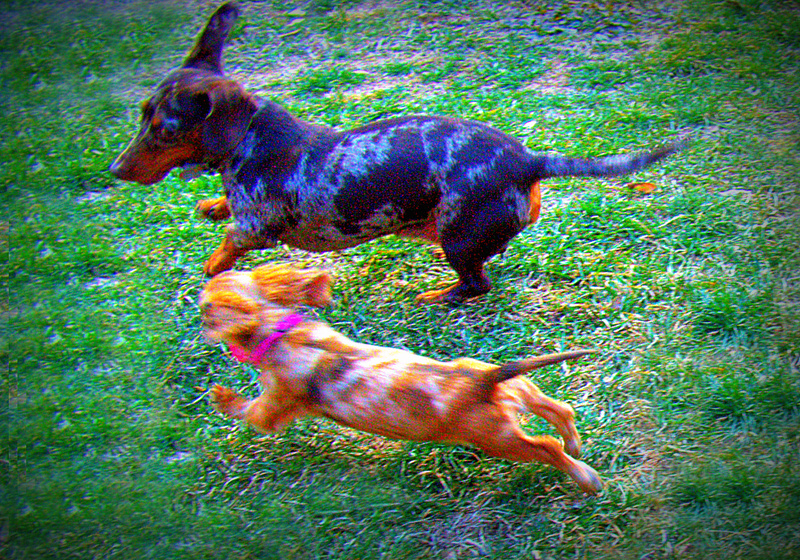 Our younger daschund, Chloe, is finally getting settled in to the fact that she is a wiener dog. 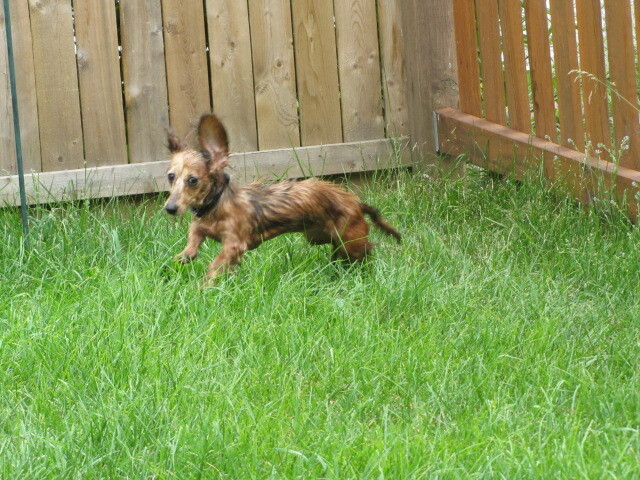 She still has plenty of puppy left in her--which, of course, means that our older doxie, Dexter, is having those same puppy traits reignited in himself. She is learning how to lay down and not run constantly and curl up and be lazy just like her parents a regular hound dog should. Still, that doesn't mean she hasn't stopped being a mischievous dog. She was sleeping through the night, more or less, until about six weeks ago. Around that time she decided that she was going to start waking us up approximately every two hours or so to go out, where she would immediately run around the yard at like two in the morning doing absolutely nothing except forcing me to come up with new and creative profanities to use. We assumed this was a phase. Dexter did the same thing, though his phase only lasted about two or three weeks. We thought perhaps this was her way of coping with the change in the weather and we would eventually have to sit her down and tell that that most people dealt with this by going to the state store and not by waking us up and pretending to piddle every hour like the world's most useless and disgusting cuckoo clock. Now, I will admit: when I take Chloe out, I am not exactly 100% paying close attention as to what she is doing. It's dark in the back yard, and it's getting cold, and I am more or less concentrating on not falling asleep in the middle of our yard. And it is not like Chloe can really do anything; we have fencing on all sides, and where we don't have fencing the neighbors do. So I normally let Chloe or Dexter do their thing, and after a few minutes I declare that potty time is over so I can crawl back into bed. I figured not paying very close attention to what she was doing was not going to be a problem. A few days ago I noticed that Chloe was hanging around the corner of the yard. 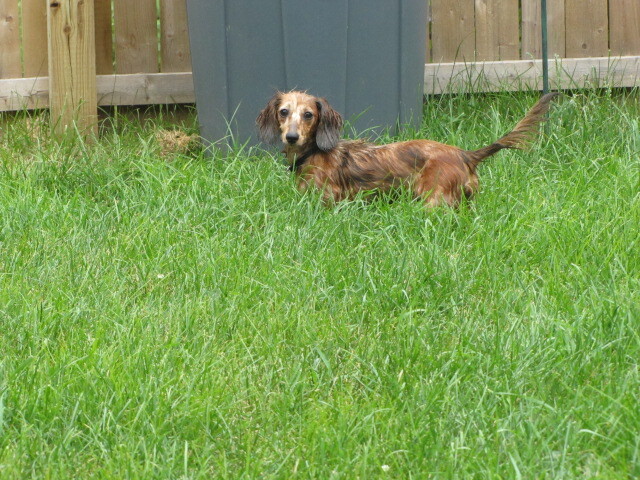 This in and of itself isn't too particularly unusual; the dogs both have a habit of picking some random spot in the yard and acting like the Secret of Fatima is hidden there which can only be discovered by snibbling at it for about twenty minutes straight. Fast forward to today. She was doing the same thing. I, of course, was woefully unprepared; I was in my socks and not paying close attention. The next thing I know--shoop!--Chloe is gone. This is not a good thing, since Chloe has absolutely no problem running for miles without stopping or knowing where she is. So I ran across the wet, frost-laden yard (in, I repeat, my socks) to see Chloe looking back at me on the other side of the fence. She was looking at me like "What cha gonna do about it?" knowing full well the answer was "not much"--by the time I ran through the gate, she could have been long gone. Thankfully, she realized that she wanted food and warmth more than deviance, so she snaked back through the hole. I scooped her up and brought her back into the house--soaking socks and all--and relaxed as another crisis was averted. FREEDOM! SWEET FREE--oh, wait, it's dinner time. The escape, upon investigation, was part of a long-planned scheme. She had dug a hole small enough under the fence to escape. This was not a one-time occurrence; she had clearly been working on this right under my own nose, probably for weeks. I got Shawshanked by my own dog.